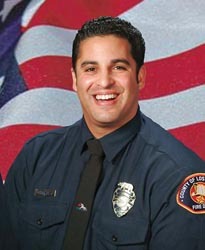 Add a video for "Arnie"
Los Angeles County Fire Fighter Specialist Arnaldo "Arnie" Quinones, 34, was killed in the line of duty on Sunday, August 30, 2009 during the Station Fire. His emergency response vehicle went over the side of the road and fell 800 feet into a steep canyon during fire suppression activities protecting Camp 16 outside the City of Palmdale, CA. The "Arnie" Hero WOD was first posted on crossfit.com as the workout of the day for Saturday, May 29, 2010 (100529).